A parasite is typically an organism that lives in or on the body of another living organism, the host, and harms it by feeding on its tissues or stealing nutrients. In the broad sense, parasites include certain bacteria, fungi, protozoans, worms, arthropods , and a few vertebrates. Bacterial, fungal, and protozoan diseases are discussed elsewhere in this encyclopedia. This article focuses on a few human diseases caused by parasitic worms and arthropods. 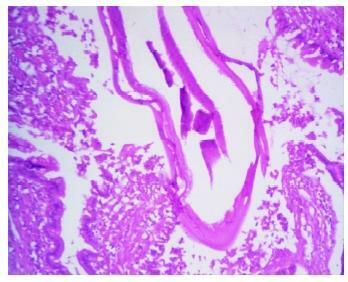 Hookworms (fuschia stain) in a dog's small intestine. Thousands of hookworks may attach to the wall of the small intestine, sucking so much blood that they make the victim severely anemic. vessel and the bladder or intestinal wall, and thus find their way into the urine or feces. When discharged into fresh water, they hatch and produce a swimming larva, the miracidium, which infects a snail. Later, another larva called the cercaria emerges from the snail and penetrates the skin of people who come in contact with the water. Eggs lodged in the human intestine or bladder, or washed by the bloodstream into the liver, cause an intense allergic reaction that leads to degeneration of these organs and often death of the victim. Cestodes in general are less pathogenic (disease-producing) than trematodes. However, the fish tapeworm, Diphyllobothrium latum, can cause severe anemia by robbing the human host of vitamin B 12 . The pork tapeworm, Taenia solium, can cause intestinal obstruction and produces eggs that sometimes hatch in the human body, leading to larval invasion of the muscles, brain, lungs, heart, and other organs. Echinococcus granulosus, a tapeworm of dogs and wolves, sometimes infects humans when a dog licks a person in the face. It does not mature in humans, but its larvae can produce hydatid cysts, ranging from grape-sized to grapefruit-sized, in the liver, brain, and lungs, with fatal results. Among the most widespread nematode infections of humans is hookworm disease, caused by Necator americanus and Ancylostoma duodenale. Hookworms are only 1 centimeter (0.4 inch) long, but thousands of them may attach to the wall of the small intestine, collectively sucking so much blood that they make a person severely anemic and stunt the victim's growth and mental development. Onchocerca volvulus, a nematode transmitted by the bites of blackflies, produces larvae that migrate through the cornea of the human eye. In parts of Latin America and Africa, it blinds many people before middle age. Blackflies breed in flowing waters, and this disease is therefore called river blindness. The major parasitic arthropods of humans are mites, ticks, fleas, lice, mosquitoes, and blood-sucking flies. In themselves, these parasites usually cause little more than irritation, although it can be intense. More seriously, however, they act as vectors —agents that transmit pathogenic viruses, bacteria, and protozoans. Millions of people have died in great epidemics of plague, transmitted by fleas, and typhus, transmitted by body lice. Malaria, transmitted by mosquitoes, remains one of the world's greatest killers and most stubborn public health problems today. Any parasitology textbook can provide further details on these and related parasites, how they infect humans, mechanisms of disease, and how to control or avoid them. Parasitic arthropods are also covered by books on medical entomology. Cheng, Thomas C. General Parasitology, 2nd ed. Orlando, FL: Academic Press, 1986. Harwood, Robert F., and Maurice T. James. Entomology in Human and Animal Health, 7th ed. New York: Macmillan, 1979. Schmidt, Gerald D., and Larry S. Roberts. Foundations of Parasitology, 6th ed. Dubuque, IA: McGraw-Hill Higher Education, 2000. Zinsser, Hans. Rats, Lice, and History. Boston: Little, Brown, 1963.